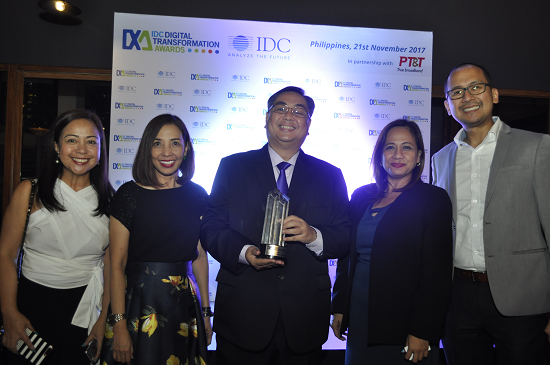 The only Philippine finalist in the IDC (International Data Corporation) Regional Summit, AIR21, the Total Logistics Solutions Provider, emerged as the 2017 Digital Transformation (DX) Leader for Operational Transformation in the Philippines during the First Digital Transformation Awards (DXa) given by the IDC on November 21 at Bonifacio Global City. BIMA and Maynilad Water Services, Inc. were also recognized as the Digital Disruptor of the Year and Digital Transformer of the Year, respectively. AIR21 President Reuben Pangan (center) received the Leader for Operational Transformation Award during the IDC Digital TransformationAwards last November 21, 2017. Joining him in the photo are (L-R) Dell EMC Enterprise Segment Manager Rowena De Guzman-Peji, E-Konek Pilipinas President Tere Eisma, AIR21 VP for Operations Yayo Estabaya, and Dell EMC System Engineering Manager Jason Yuvencio. IDC is the premier global provider of market intelligence, advisory services, and events for the information technology, telecommunications, and consumer technology markets. With more than 1,100 analysts worldwide, IDC offers global, regional, and local expertise on technology and industry opportunities and trends in over 110 countries. IDC’s DXa recognizes organizations with the best digital transformation initiatives that created a massive impact to disrupt and change their markets. IDC DX Summit and Awards 2017 held last November 28 at Gardens by the Bay in Singapore. Digital transformation Asia-Pacifc regional winners include Singapore’s Changi Airport Group, DBS, Hong Kong’s MTR Corporation, Jardine Restaurant Group, and Korea’s Lotte Department Store among others. Finalists in the Asia-Pacific region in the Operational Transformation category together with AIR21 include Postal Savings Bank of China (China), Mother Dairy Fruit & Vegetable Pvt. Ltd. (India), Sinar Mars Land (Indonesia), National Computing and Information Service (Korea), M Social Singapore (Singapore), and Taipei City Government (Taiwan). “We are thrilled with this honor not only on behalf of the officers and staff of AIR21 but for all Filipinos. To be in the list of regional finalists, which showcased the advanced tech initiatives of multinational giants in the Asia-Pacific region, went beyond any expectations we had. I credit the vision of our Chairman, Mr. Bert Lina, the work of our AIR21 analytics and operations team led by Vice President Gloria Estabaya, and our tech partners eKonek Pilipinas, Inc. and Dell-EMC for making this happen,” said AIR21 President Reuben Pangan. AIR21 began its transformation in 2013 when it implemented the automated shipment tracking and business analytics system, eliminating the need for manual service reporting. This system, when integrated with the core processes, led to increased productivity in all areas of the business—from effective delivery routing, scheduling, volume forecasting, and efficient billing cycles to productive human resource planning. The AIR21 Command Center monitors and assesses the day-to-day nationwide operations, allowing the company to make decisions faster and in real time, and offering greater flexibility in asset management. This in turn enables the company to develop preemptive solutions for short and long-term challenges, and achieve full optimization of its delivery business.